Application of a very small amperage, human compatible micro current, to effectively achieve muscle REHAB by stimulating muscle building, re-education, training, conditioning, and strengthening. Microcurrent aggressively alters the dynamics of weak and poor functioning muscles to improve performance and capacity. 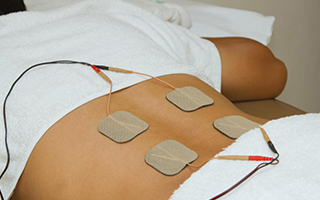 The Microcurrent electrical neuromuscular stimulator or MENS uses microamperage electrical currents to send signals into nerves using electrodes placed on the skin to reduce pain and swelling and to strengthen and condition muscles. MENS microamperage is close to the body’s actual currents, which allows it to be in close coherence with the body’s own circuitry. The application of microstimulation appears to affect cellular physiology and produce its effects by reducing the electrical resistance of the injured tissue and restoring its normal frequencies and cellular capacitance. Studies indicate that ATP (energy that fuels all biochemical functions in the body) production can be increased as much as 500% and amino acid transport and protein synthesis (necessary for tissue repair) in the treated area can be increased by 30-40%. Furthermore, MENS, can produce relatively long-lasting reduction or elimination of pain lasting several hours or days, by increasing blood flow and promoting the release of endorphins, often after a single or several treatments. Repeats stimulation with MET can produce greater benefits over time (6-8 applications) as the effects of this modality are residual and cumulative in many patients. Recommendation: The combination of Laser Therapy, Acoustic Wave Therapy and Microcurrent Therapy effectively and efficiently treats acute and chronic pain and can rehabilitate the most complex and chronic conditions.